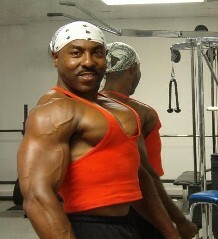 Brolic definition: Brolic is a slang word meaning big, muscular, buff, diesel, built and possibly tough and aggressive. An example would be "Nobody messes with that dude, cuz he's crazy brolic." Is it possible to get brolic fast? NO! You will have to work hard at it. But this article will give you some great tips on building up fast. 1) Diet: If you want to get big, you will need to eat big. Your body can't build big muscles if it doesn't have the building blocks it needs to build them. This is where most people fail is simply not eating enough protein and calories to build up fast. For protein eat lots of beef, turkey, chicken, fish, eggs, cheese, milk, protein shakes, etc. For carbohydrates eat brown rice, potatoes, yams, fruits, vegetables, etc. Be sure to never skip feedings and to eat small meals every 2-3 hours that you are awake. 2) Workouts: If you want to get big, you will need to lift big. Dumbbells are not going to cut it. You need to work hard on getting super strong on the big lifts such as squats, deadlifts, bench press, rows, press over head, curls and triceps extensions. Keep your sets low but your intensity high, work each lift 2 or 3 times a week and keep adding weight to the bar each and every week. Progression is the name of the game. 3) Sleep: If you want to get big, you will need to sleep big. You grow when you sleep, so get at least 8 to 10 hours every night. Do you know why prisoners get so brolic? Because they workout every day, eat like there is no tomorrow and sleep 12 or more hours every day! 4) Supplements: If you want to get big, you will need to supplement big. When you are eating right, working out as hard as you can and sleeping enough, then the next thing you want to do is take some bodybuilding supplements that really work. Some of the best supplements for getting big fast are protein powder, Andro Shock, Pumped Extreme and Nitrobol. Truly Huge Bodybuilding Program - This program can boost your recuperation ability, allowing you to increase your strength every workout and make size gains every week. The human body is quite capable of making gains each and every week, if it is trained and rested at the proper time within the recuperative cycle. You will also learn the "laws" that guarantee you huge muscle growth and how to blast through all plateaus! Also Checkout Our Bodybuilding Supplements That Work!